UPDATED: Mon., April 8, 2019, 8:10 p.m. Following the Vandals practice Monday, Idaho coach Paul Petrino delivered a fundamental precept. For Idaho, the hitters came out second best in last Friday’s scrimmage and Monday’s practice — a situation Petrino hopes will improve itself when several injured defensive players return and when that side of the ball is bolstered by “new guys coming in the fall,” he said. The corollary, though, is Vandals receivers Cutrell Haywood and Jeff Cotton have been lighting up spring practices, because the quarterbacks have time to throw downfield. A veteran offensive line “is playing really good right now,” Petrino said. The unit is led by All-America guard Noah Johnson. Going into his senior year, he said he is bigger, faster and stronger, and the shoulder injury that forced him to sit out last spring is no longer a concern. “I’m definitely enjoying this spring,” Johnson said. Floyd says he is quicker off the ball and better able to win one-on-one matchups. Petrino also said redshirt junior Conner Vrba “is playing the best football since he’s been here,” and redshirt freshman Seth Carnahan has taken a step forward this spring. Consistent leadership was lacking among Vandals linemen last year, said Floyd, and Johnson plans to take on that responsibility. “Last year, I led by example. I never wanted to show myself being tired. This year I’m going to take on a more vocal role in the huddle,” he said. The example wasn’t lost on teammates, however, according to Floyd. “Noah Johnson, he’s just that guy that can pick anyone up,” he said. 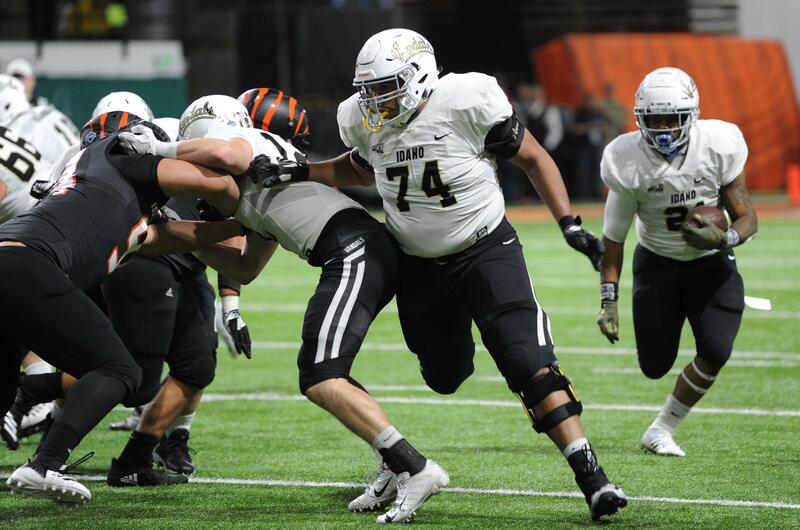 The younger Johnson wrapped up his senior year of high school in Arkansas a semester early to be able to participate in spring practice with the Vandals. “Almost throughout my entire life I’ve been looking up to my brother. He’s been a great example to me, both in football and in his regular life,” he said. As a linebacker and edge rusher, Coleman doesn’t square off against his older brother in practice, and they don’t demonstrate points of blocking or rushing technique on each other at home, he said. But he is trying to apply a piece of advice Noah gave him. It’s the kind of thing that might help him get to a quarterback for a crucial play — just not one of Idaho’s quarterbacks this spring. Published: April 8, 2019, 7:56 p.m. Updated: April 8, 2019, 8:10 p.m.